In October 2012 Priama akcia (PA) will publish a pamphlet called “How to Create a Group Dealing with Workplace and Community Related Problems” in Slovak language. This Afterword is the final part of the pamphlet and was written by PA members. It is basically an attempt to take a look at the SeaSol concept from the Slovak perspective. At the same time it is an attempt to compare the approach taken by solidarity networks with the approach of anarcho-syndicalist organizations. An English version is provided on PA website and on libcom.org with the aim to stir debate. The Afterword was offered to several comrades in different countries for reading and comments before publishing and we are glad some of the comrades responded. Despite the fact we don’t include the debate that followed via e-mails here we would welcome their comments either in form of the original responses sent to PA or any other comments! Many thanks goes also to the comrades who helped with the grammar corrections. As for the content of the whole pamphlet, besides the Afterword, it contains two Seattle Solidarity Network (SeaSol) texts translated into Slovak („Building a Solidarity Network Guide“ and „Interview With SeaSol by Libcom.org“ from Build Your Own Solidarity Network originally published by Workers Solidarity Alliance in 2011) and three examples of concrete SeaSol struggles (Gladys, Dominic, Naftali) taken from already published articles on PA website. In the history of workers’ struggle against capitalism and the state there are many political tendencies and different attitudes towards problem solving in the workplace and community. Since the anarchosyndicalist tradition is the closest to us and we know the most about its practical use, we decided to compare it to the approach taken by SeaSol. We did it also because at the first glance, SeaSol approach is almost identical to the approach of Priama akcia (PA) and other anarchosyndicalist organizations (especially smaller ones). Undoubtedly the issue can be viewed in a broader context, but we wanted to provide the shortest, most comprehensive and especially the most practical afterword to what is written on the previous pages. •	use very similar tactics or methods and both try to encourage the self-activity of people in a struggle and to spread solidarity. •	What should be the strategy and aims of an organization dedicated to problems in a workplace and community? •	Do we need a new organization to achieve these aims or can they be accommodated within an already existing one? We do not take our response formulated in this afterword to be a generally valid truth – more likely an invitation for further discussion. 1)	Strategy and Aims of an Organization: Do We Want to Build Solidarity Networks or Workplace and Community Groups? To better understand the differences in the area of strategy and aims we extract one more quote from the part about creating organizational structures being an example of a mid-term aim: “Our aim is to build an organization consisting of individuals and independent groups functioning in the community (local groups), in individual industrial branches (industrial groups) and in concrete companies (workplace groups).” In another part of the Statutes we clarify that “… the primary function of the [workplace] group is to improve the working and wage conditions of the workers. The activity of the group is focused mainly on the involvement of as many workers as possible in the decision-making process. To this end, group meetings or general assemblies are called in the workplace or outside it. So, when we return to the question raised in the title, according to us the answer depends mostly on the mid-term and long-term aims of the organization. If the only thing we want is to help people with a problem and in the process gain more self-confidence and skills, a solidarity network can be a fine choice. Despite the fact that probably the most successful solidarity network, SeaSol, was started by people who also wanted to include in their activities a criticism of capitalism and the state, solidarity networks do not have a mid-term and a long-term strategy and aims. They concentrate on short-term conflicts and campaigns to achieve immediate demands. Usually they help people who have already left the workplace or moved out. This quote is probably the best description of the nature, functioning and also limits of solidarity networks. In contrast to this approach, the aim of anarchosyndicalist organizations and also PA is to build an organization, which can effectively prevent a worker being dismissed or cheated, or to achieve reinstatement. Anarchosyndicalists not only solve the consequences (e.g. winning an overdue wage for a dismissed worker, which is a common activity of solidarity networks as well); they strive to influence the working conditions (e.g. fight for higher wages together with fellow workers) or solve problems outside the workplace, i.e. in the communities their members live (activities of the Polish ZSP in the Warsaw tenants’ movement are a good example). Although solidarity networks try to build workers’ self-confidence and develop their organizational abilities, communication and other skills, and organize an ever increasing number of people, they do not aim to create groups in individual workplaces and communities. If they wanted to go in this direction, they would have to change their strategy as well as organizational structure, define their mid-term and long-term aims and do more than “just” offer solidarity to those outside the workplace or community. They would become similar to a trade union or an anarchosyndicalist union. It is true that today we do not have the capacity to create workplace groups and realize larger projects, campaigns or struggles, and we neither claim that such things can be done immediately. However, we think it is important to understand that workplace groups are a key factor if we want to move towards a society without capitalism and state, and therefore we should strive to create them. In the meantime let’s do what we can with our abilities, resources and energy, at the same time not forgetting that our activity has more than just short-term aims. 2)	A New or an Already Existing Organization? When discussing the differences between a solidarity network and an anarchosyndicalist organization in our geographical setting, it is important to answer a simple question: if the functions of a solidarity network are fulfilled by an already existing organization, why not join its activities and draw from its experience instead of starting from scratch? These statements sound unclear and do not say what happens to SeaSol if it indeed adjusts its strategy. Therefore, we contacted the authors of the text and found out more in a discussion on libcom.org. In other words, the authors of the text consider the shift towards groups in the workplace possible, but it would not be SeaSol anymore. Either people would create their own (formal or informal) organizations in the workplace, or they would join the IWW. The Seattle Solidarity Network filled the existing vacuum in the field of workplace and community activities and got together the scattered anticapitalist and anarchist activists in a big city into a group focused on these issues. In Slovakia there is no such situation, which we consider rather an advantage. What is done by two organizations in the USA is here (and in other countries outside USA) the aim of one organization, in Slovakia of PA. Some could object that not everyone wants to be a member of PA. Therefore, we would like to clarify that membership in PA is not a condition of expressing support in a struggle. This concerns people who need solidarity as well as those who offer it. So far, we have encountered no problems with this approach and people who have joined solidarity actions organized by PA did not mind that PA was signed under the action. We think that people cannot be pushed into becoming members. It is a decision they have to arrive at without pressure. It should be based on their own needs and interests. Only time will show, if they express their solidarity more than once or twice, and if they really want to be active systematically. In PA, we do not have an official “sympathizer” status common for other organizations, but our activities are often joined by people who find them meaningful but do not wish to be members. We respect people’s reservations towards membership in an organization, or that they want to think it through, because membership represents a certain commitment and responsibility. It is possible to cooperate with PA and support the struggles we engage in also without becoming members. Our aim is mainly that those who joined the struggle (no matter if they are members or not) see in the course of the struggle that it makes sense to stay active – at least by supporting people in other struggles. According to us, it rather does more harm to have a lot of members who are unreliable or exist only on paper. We would like to conclude the question, whether to create a new organization (solidarity network) or engage in an existing one, as follows: if we take into account experiences of PA, international solidarity bonds and the fact that we have been realizing activities similar to SeaSol activities considering them a part of our long-term strategy, then it seems pointless and maybe even counterproductive to create solidarity networks in Slovakia. Sooner or later, the activists of such solidarity networks would have to answer the question: what exactly are we building and are we heading for it with the right type of organization? Regardless of the conclusions drawn from this publication and the afterword, the prerequisites to realizing solidarity activities are responsibility, focus on a small area of problems, and the necessity to find time also for things which can be very tiresome (arranging things, adjusting details, unexpected and unplanned situations…). We do not want to discourage people, nor pretend that everything is as easy as it appears from the well-written and encouraging text from the SeaSol members. In our afterword, we tried to summarize some differences between the solidarity networks and organizations drawing from the anarchosyndicalist tradition. We do not think this summary is exhaustive and we are open to further discussion. We would be grateful for any feedback and critical and constructive comments. 1) We focus, however, mainly on problems in the workplace, not in the community. The reason is quite simple – we have encountered them more often, have more information about them and think that we can solve them more easily with our current strength. Certainly, this situation can change. 4) On the contrary, in the past the organizing and development of PA activities was significantly slowed down by such members who did not know clearly why they are in the organization in the first place. thanks for this! very interesting to see our situation in north america analyzed from comrades in PA! i have recently heard of a new development where seasol is actually trying to start a workplace group, and apparently the iww isn't getting involved. it would be interesting to hear more about that from anyone who cares to share. i think the main reason you don't see these things all meshed into one group is yes because of the origins of all these types of organizations in north america. even though many anarchists are in the iww they are also found in specifically anarchist organizations like the wsa, so there can be a place for explicitly anarchist politics. there is a lot of overlap between these organizations and the iww, but because of the lack of other community organizing they often get involved in other community groups or with more militant trade unions (when not the IWW). more noticeably in the last few years because of this lack of community organizing by groups like the iww members of these organizations have started up solidarity networks after seeing the success of that model, and also lacking such a group to do work in their area, or because internal workplace organizing in the iww and other unions doesn't exactly give people short term results that inspires more people to work with anarchists. i guess i am highlighting this because it would be my opinion that if i was to probably start completely new, i'd probably just start one group (mostly to save myself headaches not because i am necessarily ideologically convinced) but i don't worry about it too much because at least in my city our crew is generally involved with all this type of work, but like with 2-3 different organizations. it's the content, not the form that counts right? idk. I find it as interesting read. It's been a long time since I've read SeaSol's pamphlet/document (or whatever was that .pdf thing that was circling around). Still, I have some questions as I believe that something is missing here. PA is questioning only organizational form. They say that they (PA) are organization with little, medium and great goals, that they have strategy (workplace groups), that their members are anarchists etc. while SeaSol “fogs politics” and that it can not continue to exist in this organizational form. So, sooner or later they’ll have to become anarcho-syndicalist organization like PA (or like we have in Europe). This is PA’s quote on SeaSol. Now, I what about methods of struggle? Are SeaSol methods only thing that you can use in such struggle. Now, what is my problem with that? My problem is that within this framework you are staying locked in this circle of one-man struggles and small reformist struggles. I tend to think of myself as someone who is not idealist, and I’m completely aware that we need to participate in reformist struggles (in certain way, of course), because organizations, movements and consciousness are build trough struggles, but what exactly are we achieving with this union like activity? And union struggles do not evolve (or rarely evolve) into anything beyond "one enterprise" level. So, when it comes to tactics on broader level this is really important question. "Every worker (including students, unemployed and retired) can be a member of PA if he/she agrees with the statutes od PA and IWA and doesn't act in conflict with them..."
"Members of PA do not have unified political views. What gets us together is the effort to improve the living and working conditions and the consent on methods, principles, functioning and aims of the organization..."
As for the methods, first you need to understand the starting point, circumstances, balance of power and things like that. Here and now we try to do what SeaSol does. When there is a person with a problem in the workplace and he or she contacts us, we try to use the methods SeaSol usually uses. But you have "one-person" problems in different types of workplaces. One thing is to get engaged in a conflict of a person who has only a few colleagues. Another thing is to find out about a problem in a factory of several dozen to hundreds or thousands workers. And also, quite another is the case when not one but several workers have a problem in a big factory and want to take action. But I think it is quite obvious that the type of the problem, the workplace and the number of people willing to take action, require different methods and the methods used by SeaSol may be of little use in some cases. What I'm trying to say is that while we appreciate the SeaSol pamphlet and the methods they use, it doesn't mean our scope of activities is as narrow as theirs. We are a different type of organization. Also, we understand our strengths and weaknesses and know which battles to pick. SeaSol and basically any reasonable organization in the world understands these things as well. So now, what are we achieving by this activity? You have to start somewhere. If you believe that an outside organization can be influential in a conflict in a mid-size factory for example, then I would be very sceptical towards that. And even if you were right, then, what exactly are you achieving by this activity? Finding 1-2 comrades with ideas close to yours? Sure, this can be true (I would say, it is not most of the time, but this is a generalization of course). Still, SeaSol can do this, PA can do this too, anyone can do this. Our approach is simple - win the battles that are winnable with current forces, build confidence, learn tricks and skills, add this to your current power and get better prepared for the next battle. And if you are lucky enough, get a few new members or people willing to help you next time. I think you should define what you mean by union struggles and how they are related to this debate. Anyone else wanting to throw in their 2 cents? SeaSol too has short, medium and long-range goals, and is actively involved in seeking out and helping to organize struggles involving groups of workers with on-the-job demands (to be won by strike action if possible, though this is not something we've done yet) as well as groups of tenants with demands vs their current landlord. Most of the distinctions being drawn between SeaSol and PA are based on false assumptions about the narrowness of SeaSol's activities and goals. This is maybe understandable since SeaSol folks tend to prefer publicizing what we've actually done, as opposed to what we merely hope to do in future. The latter is always somewhat vague until we see what works in practice. SeaSol also promotes anarchosyndicalist propaganda internally, and holds discussions where people talk about revolution (among other things) and how it's all connected to our current efforts. If you're far from Seattle and getting your info online, you couldn't be expected to know about all this, but nor should you assume something's not happening just because you don't know about it. "If you're far from Seattle and getting your info online, you couldn't be expected to know about all this, but nor should you assume something's not happening just because you don't know about it." Sorry, rudeness not intended. But the original post says, for example, "solidarity networks do not have a mid-term and a long-term strategy and aims". That is quite a strange and unwarranted claim to make. MT, sorry that it took me long time to comment. I was not at home and after I got home I've completely forgot haha So, thx for reminding me. Anyhow, you wrote a lot of stuff here, so I'm trying to address the most important ones... sorry if I miss something. Oh, then I've got it all wrong. But on the other hand, this raises another set of questions. Since PA is more of a propaganda (or political) group then an anarcho-syndicalist union, aren't non-anarchist members kind of contradiction? I understand that unions as economical organisations have this "non-ideology" policy, but I don't think that point of IWA affiliated organisations is to be an union. Without unity of politics and actions organisations pretty much reduce their politics to day-to-day "bread and butter" struggles - i.e. pure economicism, and they louse any political agenda they had. I'm not saying that this is a case with PA, especially because you're a small group, but you're kind of talking here about some kind of "blue print" you're advocating and putting it as something contrary to SeaSol model. As a mater of fact, even I could put CNT as good example of degeneration into economicism (but I don't have really will to discuss them), I'll use more "recent" example. You know that I used to be a part of an anarcho-syndicalist group and, even the group is small and nowhere near to creation of anarchist union, deficiency of political and practical unity caused and causes a lot of internal conflicts, but also political failures when it comes presenting its politics outside. So, I don't really see this as good organisational form which we should put against SeaSol. So now, what are we achieving by this activity? You have to start somewhere. If you believe that an outside organization can be influential in a conflict in a mid-size factory for example, then I would be very sceptical towards that. No, I was never claiming that. I actually think that "outside organisations" can't do much in the struggle. They can't "spark it" and they mustn't ever lead them. If there is not self activity of workers involved I don't think that there's any point in the struggle itself. I was criticising "one man actions". What is an exactly a point of them? I believe that this is the "approach" of most of organisations. Place where they differ is how do they approach battles and here I can widen this question with your question regarding my comment on "union struggles". I believe that discussion must be widen with the question of methods of struggle. With this "approach". What is wrong with SeaSol on this question? It's not just problem that they are non-permanent organisation and it's not just about their organisation form. It's about what exactly they do. Are they coming to struggle as outside organisation or are they trying to build up some kind of network between militant workers of various enterprises. I think there is actually an extreme shortage of groups that understand these things. Most groups are more concerned with ritual and symbolic activity. Also, I answered some of PA's questions via email. I don't think SeaSol has sufficiently clarified its long and medium term goals... various individuals in SeaSol have somewhat detailed ideas for medium term goals as well as vague ones for long term goals, but the majority of the group has not debated or participated in these and many are not aware of them. That's not to say that other groups have particularly clear goals, "libertarian communism" isn't an elaborate strategy, for example. as for seasol debate, thanks for your clarification! I wish Iskra had time to continue in the debate as well. I'm not in SeaSol or the IWW, but from my understanding of their pamphlet which this afterwards is based on, their strategy for moving from mutual aid for individual workers and tenants to workplace (and perhaps also neighborhood) based organization, is as good a strategy as any. Here it is as I understand it (someone correct me if I'm wrong). 2. Involve the new members in training workshops about workplace organizing (skills which are mostly applicable to tenant organizing). 3. Once an individual is trained in this, they can go back to their job and use those skills to create an IWW union local, or if the workplace is already unionized to create a militant rank and file organization within their workplace which will hopefully also draw in new IWW members as "dual-carders" (members of both their regular union and IWW). Even though most workers who approach SeaSol are seeking help for issues at a job they're no longer at, when they find a new job their organizing efforts can be done at their new workplace. The IWW remains in contact with the worker to provide ongoing support in their efforts. 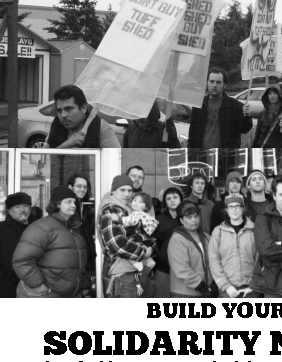 As the worker builds an organizing committee in their workplace, the others on this committee can also rely on the IWW for support and build skills through their training workshops. 4. Throughout this process, SeaSol's internal education group (SETI http://seticabal.wordpress.com/) will engage interested members in educational workshops and discussions on anarchism, revolution, and related themes. By the way, can someone from SeaSol tell us how these education efforts are going? How much participation is there from members who entered SeaSol without revolutionary politics? How are they responding to the education, is it shifting their politics?